I’m always experimenting with different recipes and cooking methods. I’ve done grilling, smoking, sous vide and a lot of other cooking techniques but recently I started experimenting with a new way to cook: Dutch oven cooking. Dutch oven cooking involves using charcoal and, obviously, a Dutch oven. A Dutch oven is a thick-walled cooking pot, usually cast iron, with a tight-fitting lid. A Dutch oven is not the same as a camp oven. A camp oven has feet while the traditional Dutch oven is flat bottomed allowing it to rest directly on the coals. 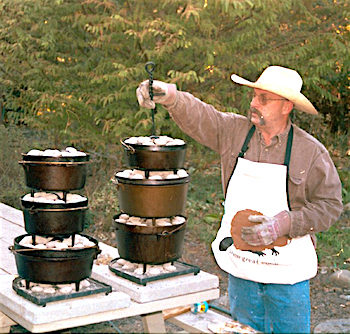 Lodge, the leading manufacturer of cast iron cookware in the U.S., provided a 12-inch six-quart cast iron Dutch oven for use in my new cooking venture and I found a cookbook that features Dutch oven cooking. 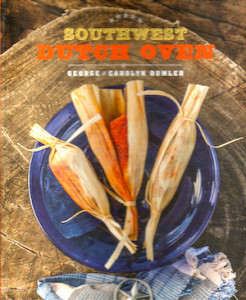 George and Carolyn Dumler have written Southwest Dutch Oven, a cookbook dedicated to Dutch oven cooking. The book is filled with recipes from appetizers to entrees to breads and dessert. To use a Dutch oven you need to prepare coals. A chimney starter works well. I set it up on my grill and let the coals burn down. 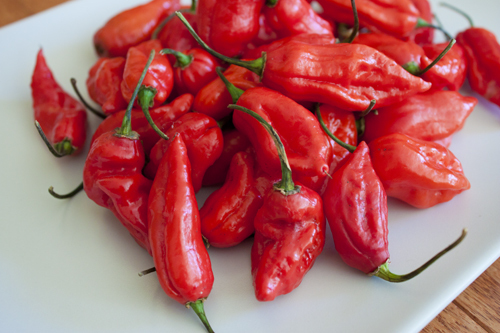 Depending on the recipe, you’ll need differing amounts of coals… most recipes use about eight to 10 coals on the bottom and 10 to 15 coals on top of the pot. Place the cumin and coriander seeds in an eight-inch Dutch oven over six to eight coals and toast until lightly browned and aromatic, about 10 minutes. Grind in a spice grinder, along with the peppercorns. Blend with the other ingredients to make a spice rub. Grease the Dutch oven and set aside. Roll each piece of pork in the spice rub and place in the center of a corn husk. Tear the other corn husks into strips. Wrap the corn husks around the pork and tie each end with the corn husk strips. Place the pork packages in the prepared Dutch oven, cover, and bake, using 10 to 12 coals underneath the oven and 14 to 16 coals on top, until a meat thermometer registers 145 degrees F., about 30 to 45 minutes. 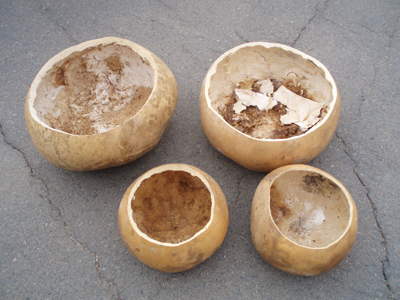 To serve, remove the cork husk strip from one end. Fold the corn husk back to expose the meat. Cook the bacon in a 10-inch Dutch oven over 12 coals until it is golden brown but not crisp. Drain the fat until about two tablespoons remain. Return oven to heat and add garlic, onion, jalapeños and serrano. Sauté about five minutes. Deglaze the pan with 14 cup broth. Stir in the cilantro, pine nuts and chile powder. Add the bread crumbs. Gently mix the stuffing and add the broth, 1/4 cup at a time, until the bread is moist but not soggy. Remove the oven from the coals to cool. Mix in the cheese and season with salt and pepper. Stuff each quail with the stuffing and tie the legs together with kitchen string. Rub the birds with 1/2 tablespoon oil. 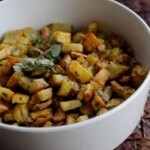 In a small bowl, mix together the cumin, sage, salt and pepper. Rub each quail with the mixture. Preheat the 14-inch Dutch oven using 12 coals underneath the oven and 14 to 16 coals on top; add remaining pil. Add quail and brown on all sides. Cover and continue baking quail, using the same coals, until juices run clear when thighs are pierced, about 25 to 30 minutes.